This project came about mainly after seeing many time-lapse videos circulating the web, TimeScapes being a good example, and seeing how they were made. Having dabbled with time-lapses in the past such as ones resulting from star trail images, I went about finding a system for myself. I was tempted only briefly by products available from Kessler and Dynamic Perception due to their price tags, it was clear a DIY option was the only way to go. After digging deep on time-lapse forums and seeing many rails of varying quality, one instantly grabbed my attention. This was Project Chronos by Chris Field. At this stage Chris had already got many rails up and running for himself and others; including one which went to Antartica! What sets this project apart from other DIY systems is the depth and openness of it all, providing a solid base for those wanting to create their own time-lapse specific rails. Project Chronos is intuitive, simple, and fully featured time-lapse controller called Chronos Controller 2. This device is needed in order to trigger the camera and advance the carriage it sits on to create the parallax. This marvelous device has great usability and functionality; its definately worth checking out Chris' Vimeo to see it in action. With the schematic and code being generously open sourced, it allowed me to design my own custom enclosure for my DIY controller. 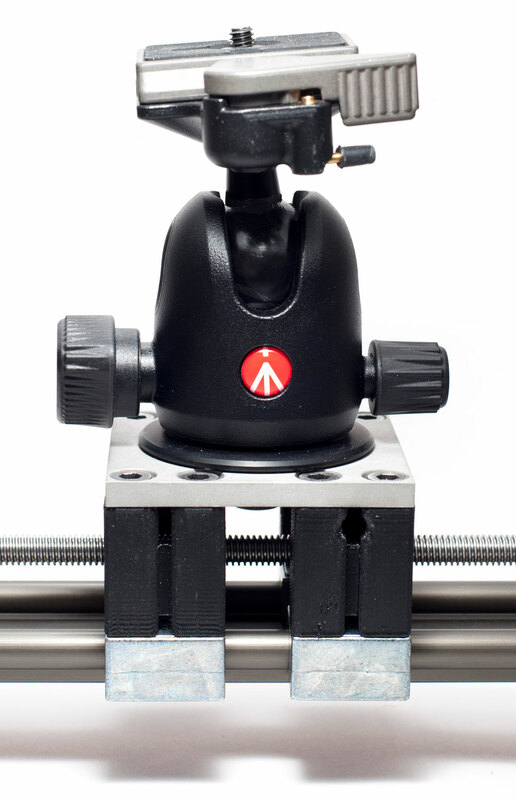 The time-lapse rail is based on an Igus WS-10-40-10 and carriage which uses polymer bearings for smooth movement. With this as the platform a stepper motor, lead-screw and anti-backlash nut (for greater accuracy) can be used to turn it into a time-lapse system. By using a lead-screw and not a belt to move the carriage means when the rail is oriented vertically, the motor doesn't need to apply much extra torque in order to move the carriage. The lead-screw locks the carriage in place whereas a belt system needs to keep the motor energised to stop the camera falling. 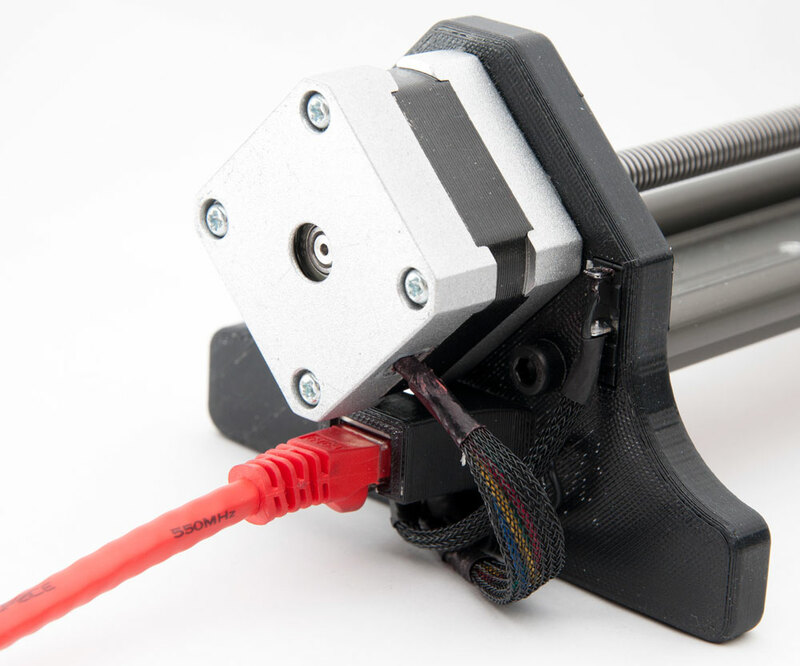 Only a small stepper motor is needed to run the rail and the system I have made is based on the Chronos Lite. I'm lucky enough to have easy access to a Stratasys Dimension 1200es FDM additive system at my University. This allowed me to add some more complex features to my designs which could not be achieved easily using a laser or basic CNC mill. It's worth noting that this system is able to deposit soluble support material allowing for effectively any geometry I desired. This proved useful when creating inlays, undercuts and a clamping feature on the carriage assembly. If you want to have a go at printing them yourselves the links to the files are below; you can also get them on Shapeways if you wish. The controller is powered by an Arduino Uno with a custom shield made from the Chronos Controller's open source schematic. I tested out the circuit after soldering in a RJ45 to link up with the stepper motor and limit switches, it worked well and didn't take up much space so decided to use it in the enclosure. 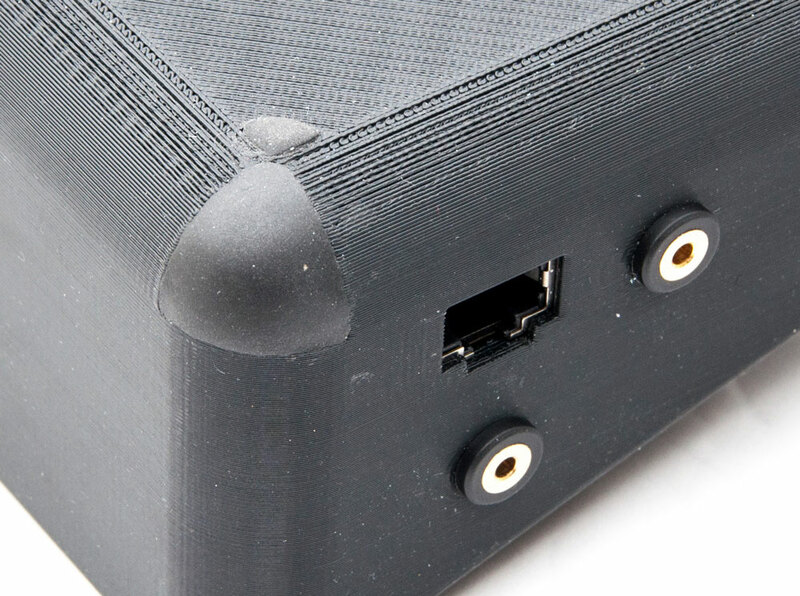 When designing the case I knew I would be using some potentiometer knobs which had a tall profile. This inspired the wedge shape to try and keep the case as compact as possible whilst still making assembly relatively easy. The idea for the inlaid acrylic panel as inspired by an EEV Blog episode about a µCurrent design, it makes the whole case extremely rigid whilst looking quite professional. 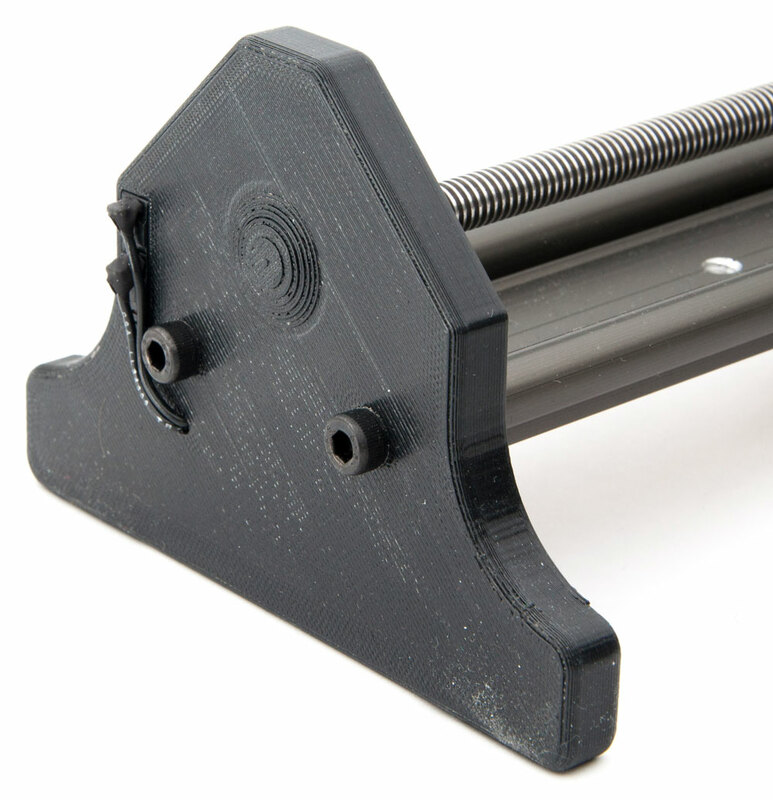 The time-lapse rail uses a stepper motor to move the camera which makes it unsuitable for use shooting video. To get the camera from one end to the other takes around 3 minutes. 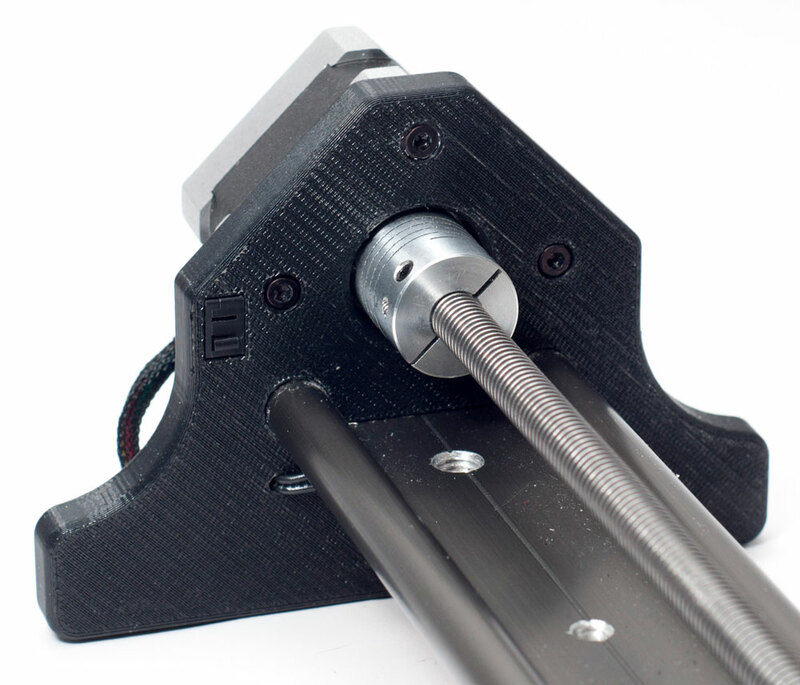 However as the Igus slider and linear bearings are very smooth, I created a clamping feature which allows the carriage to be released from the anti-backlash nut on the lead screw. This means it can be used as a manual slider very quickly just with the use of a hex key. The end plates are designed to accommodate the other RJ45, stepper motor, limit switches and bearing. They also are just wide enough that the rail is stable on a flat surface such as a bench or desk. Sugru has been incorporated into both the end plates for as much grip as possible! By using the wider feet it allows the rail to be used on uneven ground as it can be adjusting each of the four legs. They are easy to take on and off, they just unscrew. To get the threads in the feet heli-coils have been used with 8mm threaded bar. Sadly the only way you can get the system I have designed is to make it yourself. All the information to do this is available on this page and the Project Chronos Sourceforge. Click here if you want to see the parts I've used on my rail. If you need the 3D printed parts you can head to my Shapeways store. In this spirit of openness and sharing, here are some files, enjoy. They are also on Shapeways if you haven't got a 3D printer.